XR-5 is light enough to be installed on steep, trench-like slopes of landfills, yet strong enough to resist tearing and chemical deterioration. A challenging landfill job northwest of Detroit turned into a success, thanks to XR-5® geomembrane's excellent flexibility, light weight, ability to withstand temperature changes and resistance to oil, gas and chemical penetration. The 50-acre sanitary landfill, one of the largest in Michigan, is about 100 feet deep with sidewalls of sandy clay loam and a base of stable clay a minimum of 20 feet thick. The sidewalls are steep, with a slope steeper than 1:1. 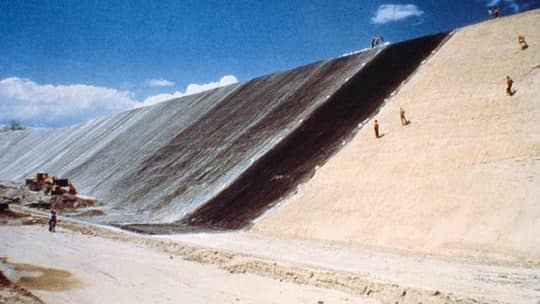 The liner needed to be a membrane light enough to be installed on the steep, trench-like slope, yet strong enough to resist tearing and chemical deterioration. Lightweight XR-5, manufactured by Seaman Corporation, was selected and was keyed at the top and bottom into a compacted clay trench. The 30-mil geomembrane material is very strong with a breaking strength of 550 pounds per linear inch, thanks to the weave in a scrim that has 20 fibers per inch in each direction (compared with the standard of 10 fibers per inch). Chemical resistance is enhanced by the use of DuPont Elvaloy resin modifier, and the liner is able to hold in methane and any leachate while resisting the effects of weather and stretching. Quarterly inspections by the Department of Natural Resources and water samples from eight test wells around the landfill confirm that XR-5 has not allowed any seepage.